Instagram today revealed several new features meant to help connect and protect users that it will add over the next few months. First up is video chatting. 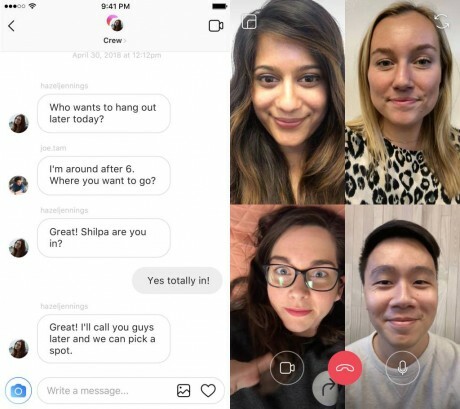 Instagram says it will bring live video chat to Instagram in the next few weeks in order to give friends a new way to spend time together. A new icon within direct message threads can be used to open one-on-one video chats between users. Another new feature on deck includes a new tool for sharing to stories. Instagram says it is allowing third-party apps, such as Spotify and GoPro, to post directly to stories from within those apps. "Just tap the share button in the Spotify or GoPro app and your content is pulled directly into the Instagram camera," explained Instagram. Content added from third-party apps can be edited and added to users' stories, or sent to others via direct message. Further, Instagram debuted a new camera effects platform for developers. This tool will let third-party apps create their own unique, interactive camera and filter experiences for end users. "That means you turn any video into a NBA dunkcam or add a cloud of hearts and Pomeranians to fluff up your photo," said Instagram. The social network is partnering with select accounts, including Ariana Grande, Baby Ariel, Liza Koshy, Vogue, and Buzzfeed, to kick off these tools with more to follow. Last, Instagram is making it easier to report bullies. Instagram says it will attempt to automatically filter comments it believes are intended to harass or upset users. "This new filter hides comments containing attacks on a person’s appearance or character, as well as threats to a person’s well-being or health," explained Instagram. The filter will also allow Instagram to take action when it receives repeated notices about abusive or problem users. These and other updates are expected to reach users over the next few weeks. Google today said Meet, its video conferencing service, will soon have the ability for participants to send and receive text and web links via chat. Google relaunched its video calling and chatting services earlier this year with an emphasis on business users. Instagram today made it possible for those broadcasting live video to play with face filters in real time. Broadcasters need only tap the face icon in the bottom right corner before or during their live stream to add filters. Facebook today dressed up the live video chatting functionality of Messenger with new effects. Family and friends can now apply reaction emoji, a variety of filters, and new masks to enliven real-time video conversations. "Instagram says it will attempt to automatically filter comments it believes are intended to harass or upset users. "This new filter hides comments containing attacks on a person’s appearance or character, as well as threats to a person’s well-being or health," explained Instagram. The filter will also allow Instagram to take action when it receives repeated notices about abusive or problem users." AUTOMATIC filtering? Yeah, this will go really well, I'm sure.